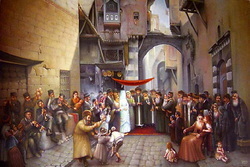 In the ashkenazi tradition, weddings are a very important occasion to celebrate. There is a definite order in which a traditional Jewish wedding is organized. First blessings are exchanged under the canopy (or "chuppah"). Then the couple drinks from a wine goblet. Follows the wrapping of a glass in a napkin, which the groom stomps on before leaving the chuppah with his wife. This breaking of the glass symbolizes the destruction of Jerusalem that took place in 70 C. E. It also a way to be reminded that the world as we know it in the present time still needs to be redeemed. This part of the wedding has gravity, and it ends with shouts of “Mazel tov!" (which means "congratulations!" and "good luck!”). Julia Elizabeth Wells was born in England in 1935. Her mother Vaudeville performer, was Jewish. Early on, they discovered her four-octave singing voice and she went on performing in music halls throughout her childhood and teens. At age 13, she sang for King George VI. Julie Elizabeth Wells is best known as Julie Andrews. She has illustrated herself on stage, screen and television for more than half a century. She has been celebrated throughout her career for her beautiful voice, her many other artistic talents, as well as her elegance and integrity. Trinkt le chaim! Siz achassen ne. Trinkt le chaim mit a glezzle vine.